Stand 21 database: over 25,000 embroidery programs will provide you with the finest in graphics! - Stand 21 benefits from multiple production lines afforded by the latest in embroidery-machine technology, providing an exceptional quality that helps present your drivers, teams and partners to the media in their best light. 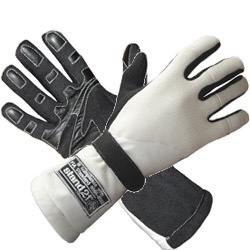 Direct embroidery can be applied to the racing suits, gloves, shoes, clothing or any other garments or accessories. - Embroidery computer programs are created directly for you by Stand 21 (over 1500 new programs created every year). - With fair pricing and sophisticated technical solutions, Stand 21 is able to offer racing teams and drivers, high-quality embroidery to best promote and convey their image, as well as their partners image. - 1. Direct embroidery achieved through a computer program. - 2. Monogram embroidery produced from a pre-established font. - 3. Personalized badges sewn on fabrics. - Direct embroideries must be sewn only on the outside layer of a racing suit. - Badges displayed on the racing suit must be ISO 15025 A certified, with an aramid-fiber background and must be sewn using aramid thread only. To run the program, you have to send us a technical design specifying all dimensions and the Pantone or Madeira color codes. The embroideries spot has to be clearly specified. The program and the embroidery prices depend on the size and complexity of the logo. liability for any illicit or abusive reproductions of a trademark. Embroider a simple lettering from the available fonts. The creation of embroidery programs is done at Stand 21 directly which guarantees monitoring and optimum quality at a very interesting price. - If you have several embroideries of the same logo to produce with sizes differing by more than 20% we will have to create a new program for each size. - Be careful, if less than 10 mm-high, letters are not clearly readable. - For program or embroidery prices, please send us a high-quality picture. - The price relies on the number of stitches needed for the embroidery. Not as visually pleasing as traditional embroidery and less wear resistant, this application process allows hot-stamping the decor on the racing suit's cloth material within a thin layer of synthetic plastic, fire & heat tested. To make this possible, the customer must provide adequate vector-produced logos and designs.